1. do you have produced a more recentrly kernel with the 1wire support ? 2. If I enclose the lines form the diffi may the latest kernel works ? Cheers and thanks for your great job !! I'm trying to get a DS18B20 working with the raspbian image. Is the i2c patch includet? if not is there a update patch for the official raspbian image? and is it possible to change the gpio pin? so that means I need to patch, right? How can i Setup Linux .config variables: W1_MASTER_GPIO W1 W1_SLAVE_THERM? You need to compile the kernel by yourself with the patch or use an existing, already patched kernel. Simply setting some variables doesn't works. If your DS18S20 is getting hot its "hot-wired" (short-circuited) - i'm sure you have interchanged the polarity (GND => 3V3 / 3V3 => GND). Please notice that the given polarity on the acme-site is from bottom view. I have only one problem left, i have installed this at firt http://www.raspberrypi.org/phpBB3/viewt ... =31&t=7471 for my wlan stick. And now, after i installed the 1wire interface the wlan stick doesnt work anymore. I think you need to re-install it because of the new kernel. But since i didn't now this installer/stick its just assumed. But i think it should work then. Seems your kernel patch for the Dallas 1-wire breaks the rtl8188cus wifi driver. This is a module that is not included in the kernel source tree. To maintain a working version it needs updating as kernel versions change but to do this I need the kernel source. Where can I find the source and patches you are using? Preferable from a source that I can use git clone/pull. To compile it yourself, you need to setup a toolchain with hard floating point support, as used for the Raspbian image (I tried it first without, but the kernel module loader crashed for some modules). See http://www.raspbian.org/RaspbianDocumentation and "Distcc Cross compiling for Raspbian" (you don't need to install distcc, but it describes how to use crosstoo-ng to create a cross compiler as well). Then check http://elinux.org/RPi_Kernel_Compilation if you want to know how to use this cross compiler to compile a new kernel. The Raspbian image used the kernel from https://github.com/raspberrypi/linux, but looks like the defconfig was not the one which was used for the 2012-07-15-wheezy-raspbian.img image. So I've extracted the config from the original Raspbian image from "/proc/config.gz" and added my configurations to it and finally created a new defconfig with "make ARCH=arm savedefconfig" and updated "arch/arm/configs/bcmrpi_defconfig" with it. This updates just the linux kernel image and the modules, because the firmware is already the current version. 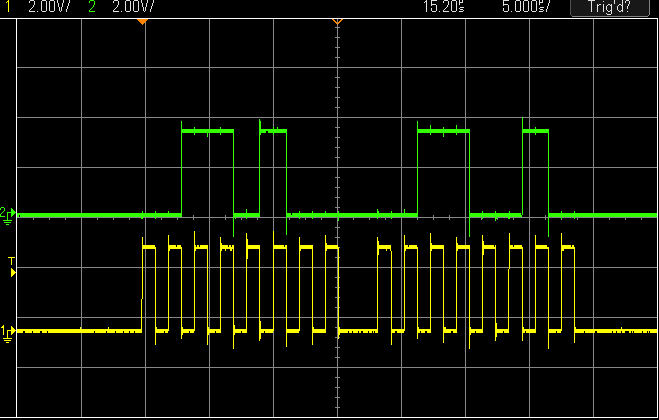 As you can see, the default transfer rate is 500 kHz, but this can be changed with a kernel boot commandline parameter. The Video 4 Linux, the new SPI and I2C driver and lots of other drivers, like the Prism2.5/3 USB driver or the RTL8192CU driver, were already enabled in the new image. Bah, can't edit posts. For the 1-wire test: "cat /sys/bus/w1/devices/22-0000001d84f2/w1_slave" depends on your connected 1-wire chip address and the address "22-0000001d84f2" is different for your chip (it is unique). Try "ls /sys/bus/w1/devices/" first. Many thanks for that. I was hoping you would provide a pre-compiled kernel as my cross-compiling options are limited. [ 105.658513] Driver for 1-wire Dallas network protocol. Yes, this is tricky. I don't know, if I did something wrong with the kernel configuration, or if the kernel changed this (which would be bad, because user mode program would break, if they don't do a switch-case based on the kernel version), but the path for the device with the previous version (kernel 3.2.18, based on bootc's kernel) was "/sys/bus/w1/devices/w1_bus_master1/22-0000001d84f2/w1_slave" and now (with kernel 3.1.9, based on the Raspbian kernel distribution) the path is "/sys/bus/w1/devices/22-0000001d84f2/w1_slave". And the 3.2.18 kernel uses "_" to separate the names in "w1 bus master", 3.1.9 uses spaces. Sorry, I didn't mentioned this change explicitly, just in the sample for the w1 test in my posting. It isn't a "fresh" system. I installed XBMC, php, apache, gpio libs,..., may that be the cause? What can I do now? do I need do cross compile ? Thank you for reply. I resolved the problem - this was a hardware conflict with my bluetooth dongle. After unplugging it I can read back data at /sys/bus/w1/. Today I'll try to start to compile my own kernel. I don't quite follow this - is the 18B20 working with Raspbian......or not? Frank, would you like to submit a pull request against github.com/raspberrypi/linux? Maybe you've installed other kernel modules, which are loaded at start? My update script was intended for a clean new installation, and it renames the /lib/modules/3.1.9+ directory , see the the update script content below. But when you say that just restoring the kernel rescued it, it can't be the modules. # load: "rm -f raspbian-w1-update ; wget http://www.frank-buss.de/raspberrypi/raspbian-w1-update"
# start as root: "bash raspbian-w1-update"
asb wrote: Frank, would you like to submit a pull request against github.com/raspberrypi/linux? I did the step by step install but got the same results -> stuck at rainbow screen. But is it normal after running "rpi-update" to patch the kernal again? maui wrote: I did the step by step install but got the same results -> stuck at rainbow screen. Good that it works now, but would have been interesting to know why it didn't worked for your installation. Maybe I should add a warning "can kill your running system, if it is not a clean Raspbian installation" in the update script But it is a temporary solution anyway. I think my pull request for the official distribution looks good now, so that it will be integrated in the next official release. maui wrote: But is it normal after running "rpi-update" to patch the kernal again? I think the "update" menu item in "raspi-config" updates the "raspi-config" program itself, only. I don't know, if the update process for Raspbian can update the Linux kernel. I've tried "apt-get update" and there were no updated packages. But you are right, if the kernel are updated, you have to run the patch again. you have to do a "apt-get upgrade" to install the new updates. But after the first install of the patch I did a rpi-update (firmware updater from Hexxeh) and I had to patch the kernal again after doing that. I should say a big Thankyou to Frank for his hard work on this. I had it up and running with no problems. The only issue now is that when soldering my A2D converter I fried it somewhat so am now looking for a new one. Everything else works fine. maui wrote: But after the first install of the patch I did a rpi-update (firmware updater from Hexxeh) and I had to patch the kernal again after doing that. Ok. I don't know which version of the firmware the rpi-update installs. The Raspbian distribution contains already a current one, e.g. you don't need to patch the kernel image anymore, like with older firmware from the first Debian distribution, so maybe no firmware update is needed. But maybe other bugs are fixed as well.